If you are a home maker who loves to clean and organize, chances are you would probably find a smart way to store your cleaning supplies and materials in a concealed place where nobody could see. Well, that;s just normal and the challenge lies with smart storage solutions. I had several sinks in both our main kitchen and dirty kitchen as well as in the laundry area but I never really make full use of those. Probably, it doesn't have sufficient shelves or dividers for me to put everything in place. 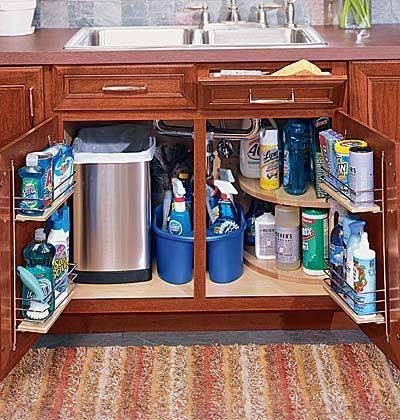 Well, this under the sink storage idea is pretty cool and a smart way to create more storage spaces on under the sink cabinets. Mine is lacking of dividers and shelves thus I can't possibly put in all those little stuff. I can't wait to try this at home!